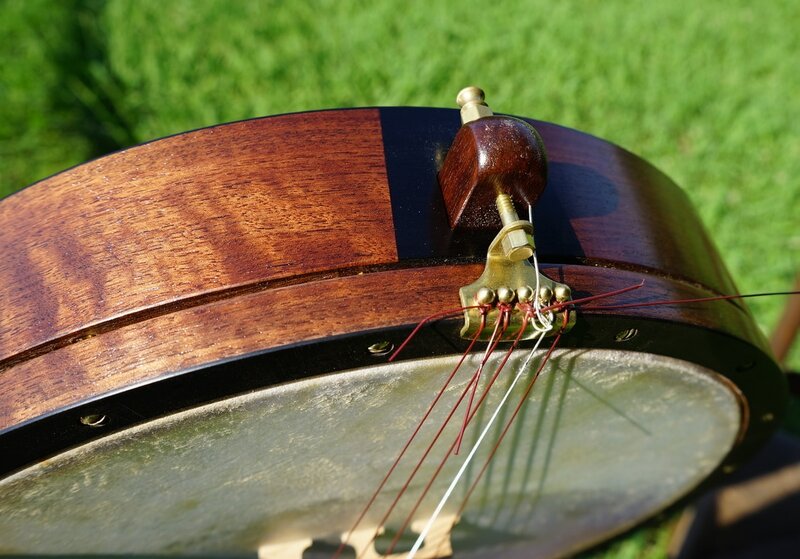 Minstrel strings, double A tuning. 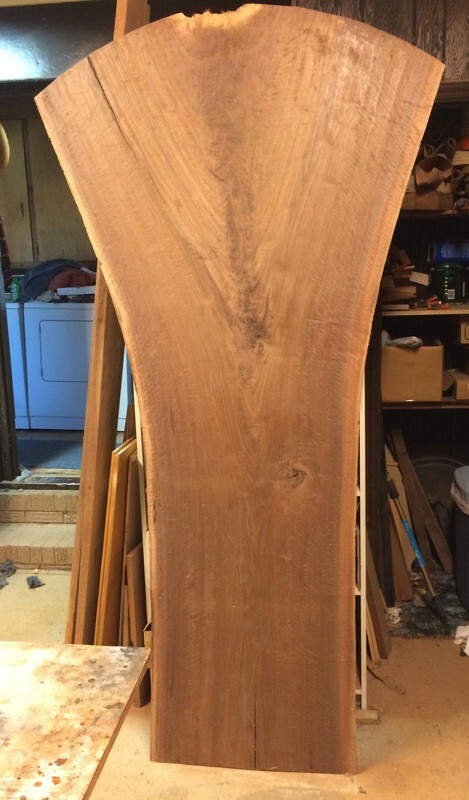 Curly walnut harvested from East Boulevard in Charlotte, N.C. from a grand old tree that died of natural causes. I have a limited supply of this gorgeous stock. Its well seasoned, air dried for 15 years. The giant tree was nearly 4 feet wide at the trunk. 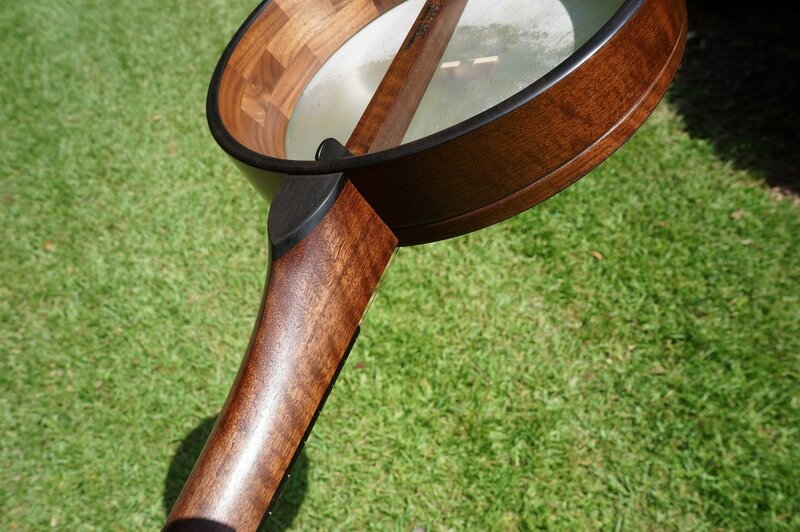 Walnut with ebony fretboard, heel cap, both rim caps. Beautiful walnut burl ven.eers on headstock front and back with a nice old indian head penny from 1888 inlayed. Brass tuners and no knot tailpiece. Thin brass tone ring that gives the tone a little pop without being too bright or ringy. 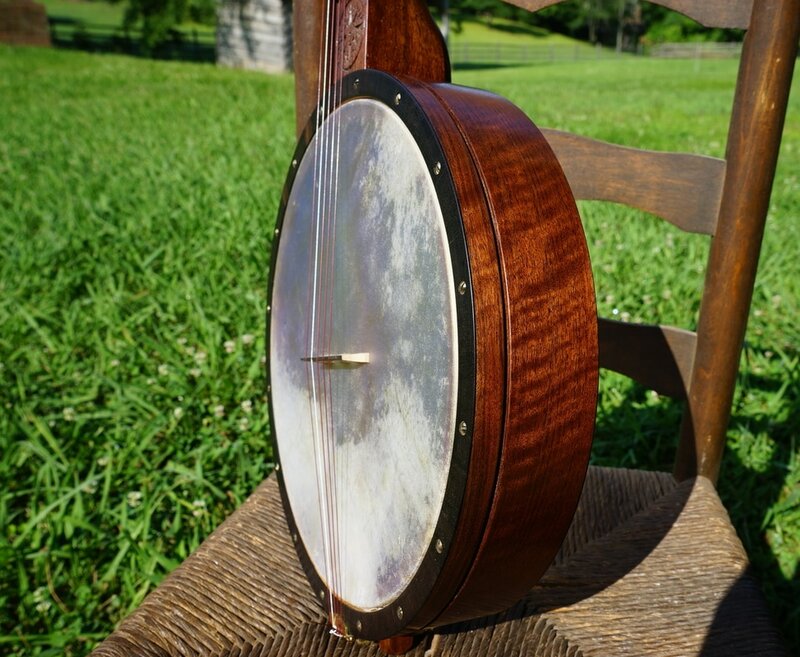 These "no bolt'' banjos are the most versatile banjos i've played. 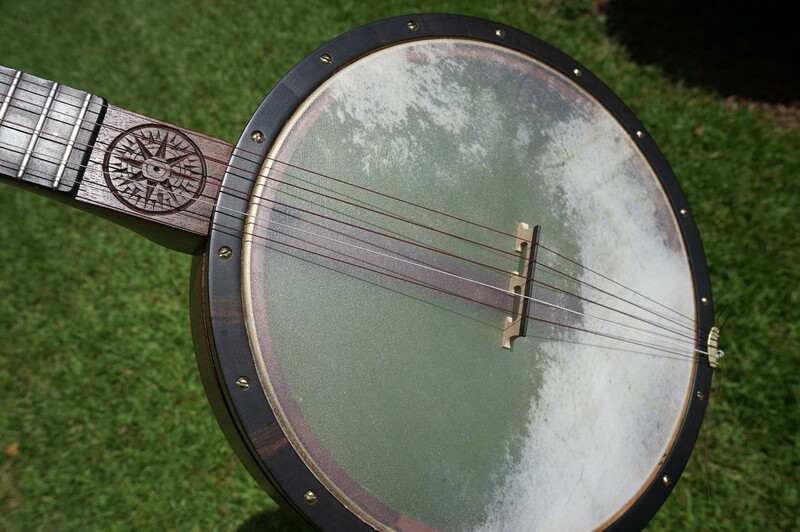 Most banjos are best suited for only one type of string, either steel or nylon/gut but the "no bolt'' banjo sounds great with any string. They are well balanced across the strings and speak equally well up the neck. You can listen to the sound clips and judge for yourself and pick the tone you like best! All recordings are made in the same spot, same settings and start with the same song so the comparison is accurate. 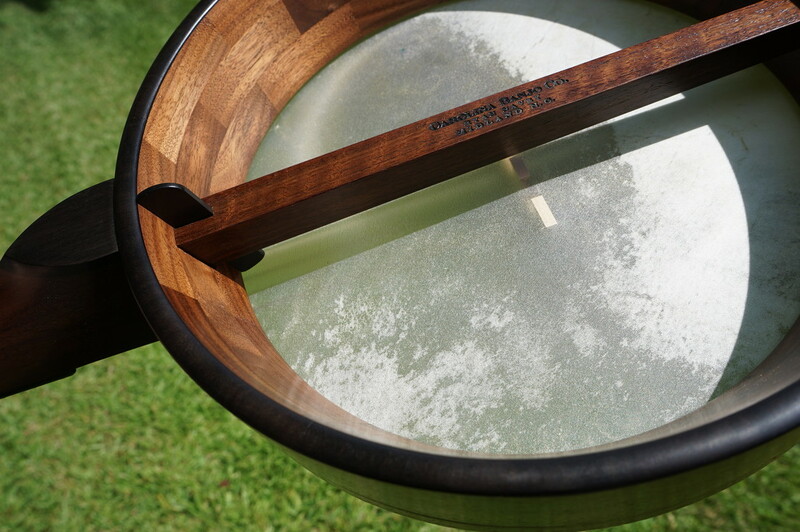 ​Segmented walnut rim with thick veneer around. Ebony fretboard, heel cap, rim cap and tension hoop cap. Traditional dowel stick construction held tight with a tapered ebony key. Brass position markers on fretboard front and side. ​ Can be strung with steel, nylon or gut strings with two different nuts, one of bone for steel strings and one of ebony for nylon or gut strings as they require a higher action to avoid buzzing. 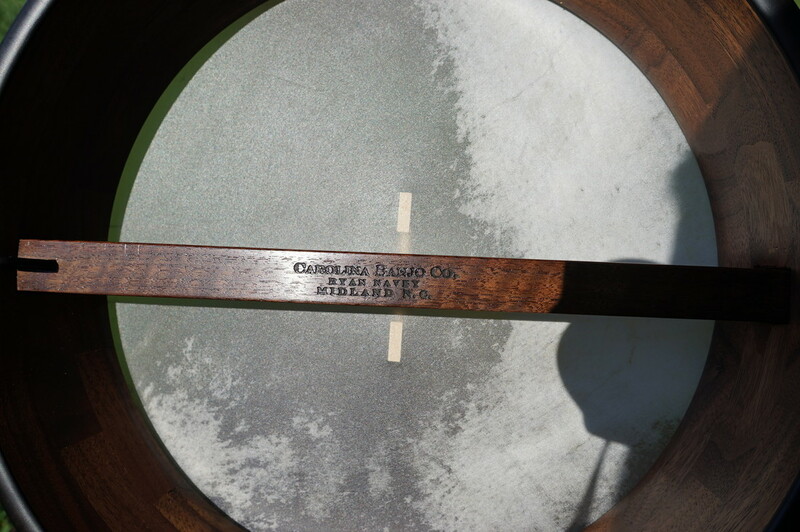 Calfskin head, nautical star carving on the frailing scoop.